L is in town again today, non-shopping, and I go to assist, just in case she wants me to. On the way I pass the massive queues outside the Gin Festival at Trent Uni. Possibly the biggest women only drinking event to have ever hit Nottingham and it’s only 12 noon. I meet L and Daughter in John Lewis where L is trying on dresses. I attempt to block all exits to stop her escaping without buying something. In the end I talk her L in to one dress and out of another. Not literally but maybe later. 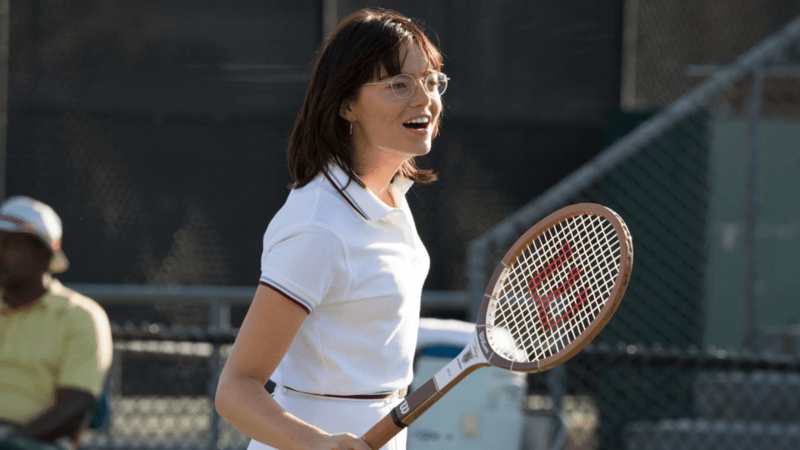 The Battle of the Sexes is primarily about the exhibition tennis match in 1973 between possibly the best female tennis player at that time Billie Jean King (Emma Stone) and three time Wimbledon men’s champion 55-year-old Bobby Riggs (Steve Carell). However the film is much more than that, focusing on the off court drama as well. It tries to cover the formation of WTA (Women’s Tennis Association) and King also falling in love with another woman at the same time. In a way it’s a mini biography of her life but it has to shuffle the timeline and some facts to do so. King was indeed instrumental in the formation of the WTA after she became annoyed that the male players were receiving cash prizes up to eight times that of the women, despite the fact they attracted just as many spectators. So in 1970, King and seven other women started to set up their own breakaway tournaments which led eventually to the formation of the WTA in 1973. The WTA went on to be hugely successful and is still going strong today. 1973 was also the year that Riggs, a self-proclaimed male chauvinist pig who was clearly missing the limelight, challenged the then world number one Margaret Court to a match. In his eyes this would prove that men are better than women at tennis and well better, full stop. He easily beat a poorly prepared Court on what became known as the Mother’s Day Massacre. When he subsequently challenged King she also accepted, despite previously saying that she wouldn’t but now feeling that she needed to fly the flag for womankind to make up for Court's failings. Riggs wasted no time in ramping up the acrimony by going on TV to proclaim that women only belong in the kitchen and the bedroom. King seems to take the latter bit of advice on board, although not in a way that Riggs would have appreciated, when she takes her hairdresser Marilyn Barnett (Andrea Riseborough) back to her hotel room. It is also not greatly appreciated by King’s husband Larry (Austin Stowell). In reality Barnett was actually King’s secretary and the affair had already been going for two years but the film alters this point despite the reality being possibly even more fascinating. Along with the fact it was Barnett who outed her secret superstar girlfriend eight years later. 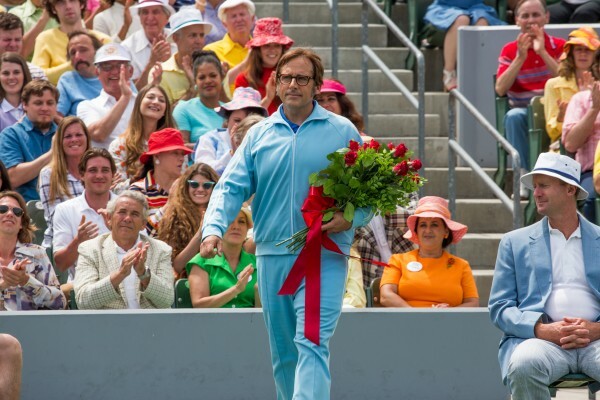 Their relationship, as well as disrupting her marriage, doesn’t do a lot for her concentration on the tennis court but she bounces back to beat Riggs in rather exaggerated movie style in their game at the Houston Astrodome. Despite my initial reservations the film is surprisingly entertaining, smart and well-acted. It also has the potential to educate, inspire and make you 'google', in a time when not enough films attempt to do so. Stone is once again excellent, among other things making her relationship with Riseborough very believable. If anything the film attempts to cover too much and spreads itself a bit thin to do so. It does actually make me want to see a full biopic of BJK. Afterwards, yet again we struggle to get served in the Old Angel and this time give up, despite the fact their selling Tiny Rebel’s Stay Puft on draft. Instead we go to the Peacock where the OP is off, so its not a great beer night so far. They do have Fuller’s Damson Porter instead.